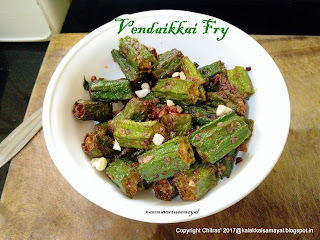 #VendaikkaiFry - #LadiesFingerFry : #LadiesFinger is called #Vendaikkai or #vendakkai in Thamizh. 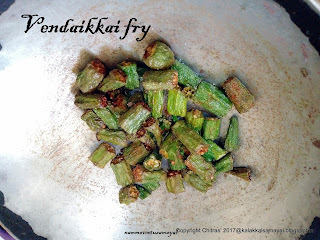 It is also widely known as #Okra. This vegetable is liked by all. 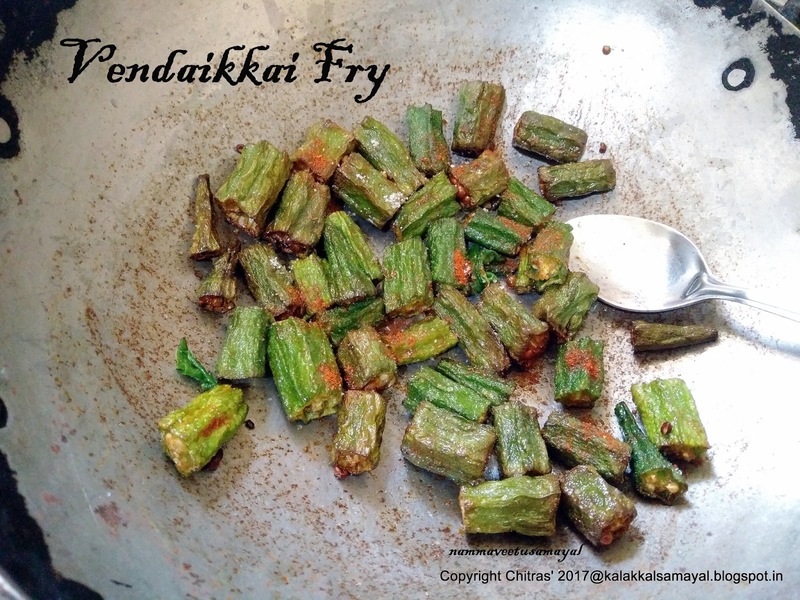 I usually make #Vendaikkai curry, sambar or moreKuzhambu. Recently when we asked a cook to prepare lunch at home for a function, he prepared a dry curry using #LadiesFinger. It was an instant hit with small children. The preparation is very simple but tasty n spicy. Wash Ladies finger in water two or three time. Then pat dry with a dry and clean kitchen towel. Snap top and bottom of the ladie finger. Chop into 3/4 inch pieces and spread on a clean and dry plate. 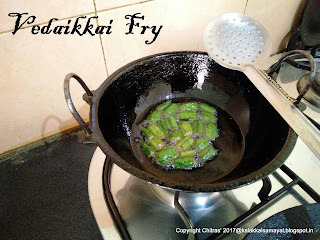 Heat oil in a kadai on a stove over medium flame. When oil becomes hot and starts fuming slowly drop 8 to ten pieces. 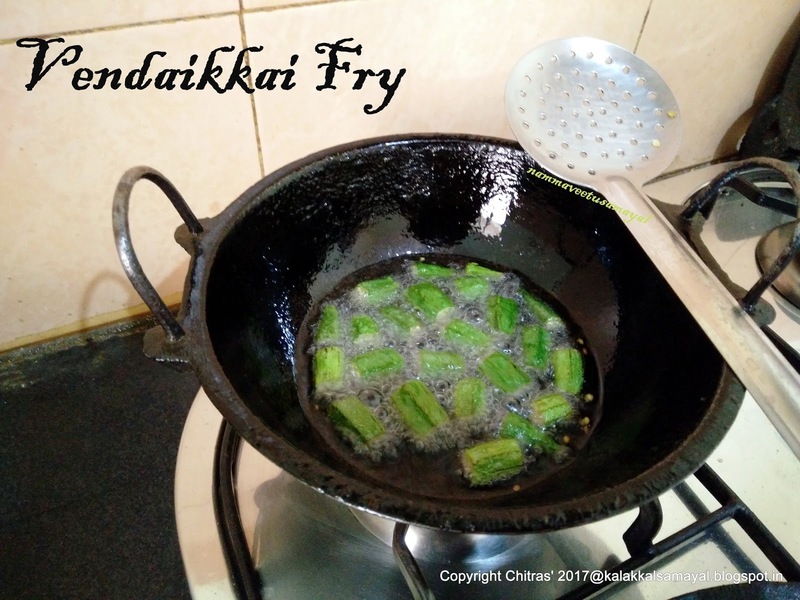 Fry till soft and bubbling of oil stops. Transfer into a wide mouthed vessel or plate. 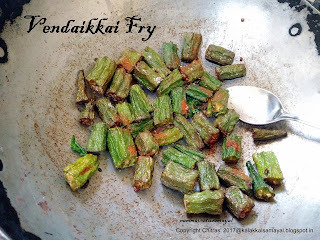 In the same way fry all the vendaikkai pieces in batches. 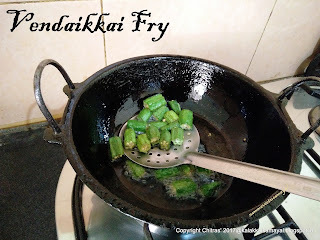 Then sprinkle red chilly powder, cumin powder and salt over the fried vendaikkai pieces. Mix gently to coat the pieces well. Now spicy tasty crispy vendaikkai fry ready. Enjoy sambar or rasam rice! !